I mentioned a week or so ago that DD wanted to redecorate her room. With her learning difficulties, she doesn’t always understand when I try to explain to her why something is maybe not the best idea. Trying to let go a bit I made the mistake of telling her she could pick the adhesive wallpaper border for her new room. She picked a sideways stripe. Ugh. In BROWN. Double Ugh. And as this is quite an old house, there are no walls that are square and true. Somehow the stripes just made that stand out. 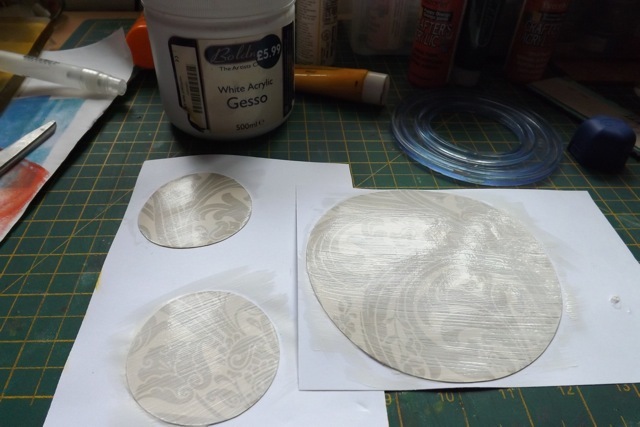 So I had the idea of cutting out some circles from the remains and then of getting a sample of a nicer border and cutting out some circles from that. Applying them 1/2 on 1/2 off the stripes it really made the whole thing just a bit more fun and funky. Why am I telling you this? Well in the end I had just a bit of the border left so I went ahead and cut some circles. 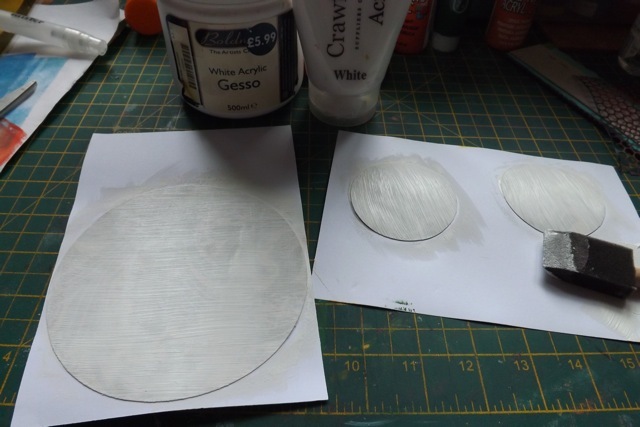 Then a coat of white acrylic paint to better hide the pattern. This was pretty faint anyway and covered easy. Then I printed on them. I just addd some temp adhesive to the liner on the back, the bit that gets peeled off, and stuck them to printer paper, to make the printing easier. Then I stamped on them. Now I can add them to my craft room wall for a bit of instant decor. As they are meant to peel off without damaging the walls (although our walls have revolting textured covering – I am pretty sure it’s called “pebble dash” and that looks exactly as yo would expect it to look) I know after the third or fourth border change in DDs room, it DOES strip off the paint if there are cracks in the plastering. Also if you are one to wash your walls, I certainly would put a coat of Mod Podge or the like over it, so you don\t sweep over it and somehow transfer the paint to the walls. I know here in the UK most stores have an open roll so you can tear off a chunk to take home. If you want to do 50 of them and decorate your whole room, I would say buy a roll. If you just want to do 10 or so, you may be OK with just a sample. And frankly, you could do the same with lots of different arty techniques – just be aware of them. If the kids get into a water gun fight in the lounge, you are heading for a disaster if you used Distress ink LOL! 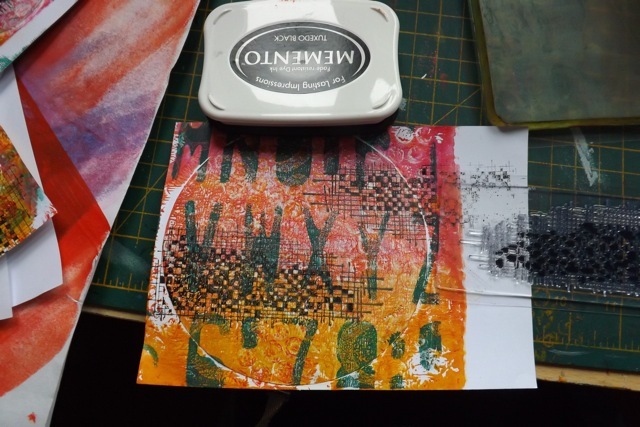 Now, with the 6 x 6 inch plate, I don’t know if I could do, for example, a whole border – the prints would have t be side by side, maybe slightly overlapped, but even so I think the “join” would be pretty obvious, even with a very limited colour palette and maybe some stamping to try to hide it. 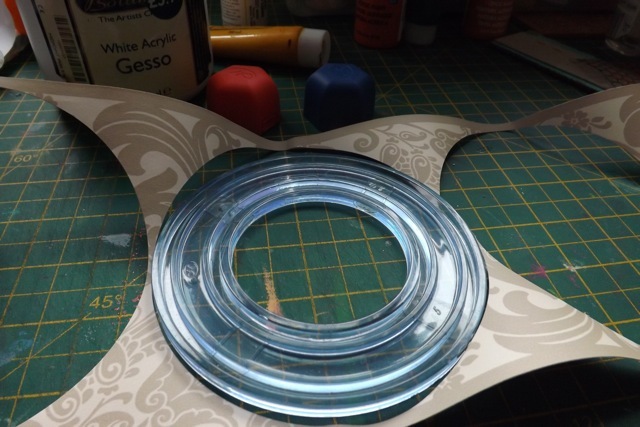 The circles (or whatever shape you can cut) add a bit of interest without being overwhelming. But you could do a whole BUNCH of circles, as if they were a border. Just mark a line with painter’s tape, scatter the circles above, on, and below, overlapping a few, etc. till you have the effect you want. I’m not sure if doing a recipe card for this is worth it – it may be of limited appeal and I hate to make people print a set of two when is something they will never do. So should I make this one and hold off for another oddball technique to match it with? Find something else to mate with the Ombre one I did? DOH! 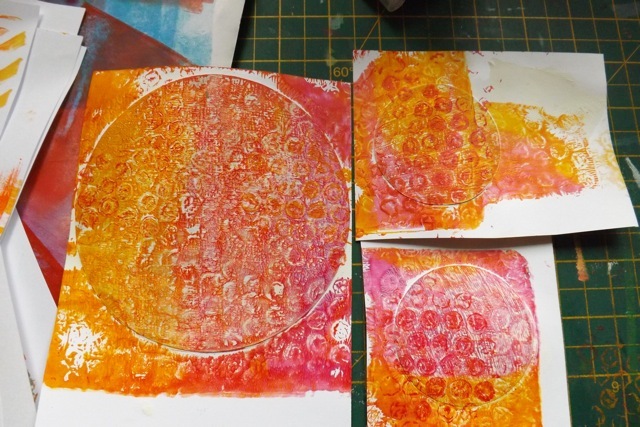 Categories: art, Gelli plate monoprints, Uncategorized | Tags: art techniques, Gelli plate, Gelli Print | Permalink. My apology. I hit the side of your site and all of a sudden your pics were bigger???? I love your site and projects. I just wish your pics were a little larger…..for bad eyes! Your color and pattern and layers are so much more fun than the original print of the wallpaper! So glad you shared this with the party! You have the most amazing ideas. Thanks for sharing them. I think the recipe cards are a great idea and any that you have time to make are worth it. You could even end up publishing a book. 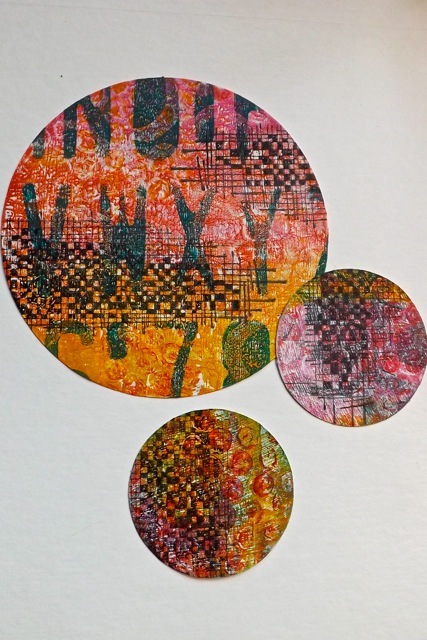 I am amazed at what you have done with a 6×6 gelli plate girl. Amazing work. You are quite talented and I love your blog everyday. The wallpaper was the icing on the cake. Loved it. Maybe a coat of gel medium would help with the running of colors. While I would totally love a bigger plate just to see what I can do with it, I am mostly happy with the 6 x 6 one.